Our day started out with breakfast at 7:30 a.m. After breakfast, we enjoyed a short break before heading out to the fields. It was a cool 45 degrees and overcast which made for very comfortable playing conditions especially since the rains that we had overnight stopped before we started our day. 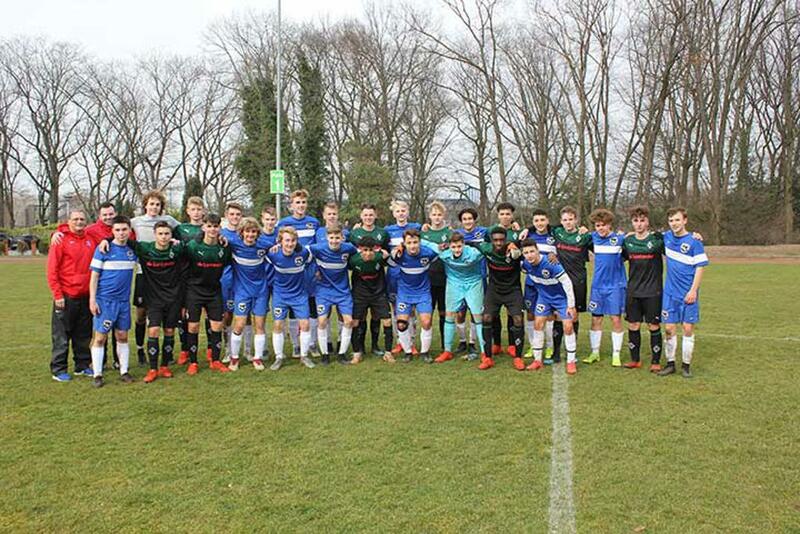 Our 2003 and 2004 ODP teams trained for an hour at 9:00 a.m. and many came to the field afterwards to watch our ‘02’s game versus Borussia Monchengladbach. 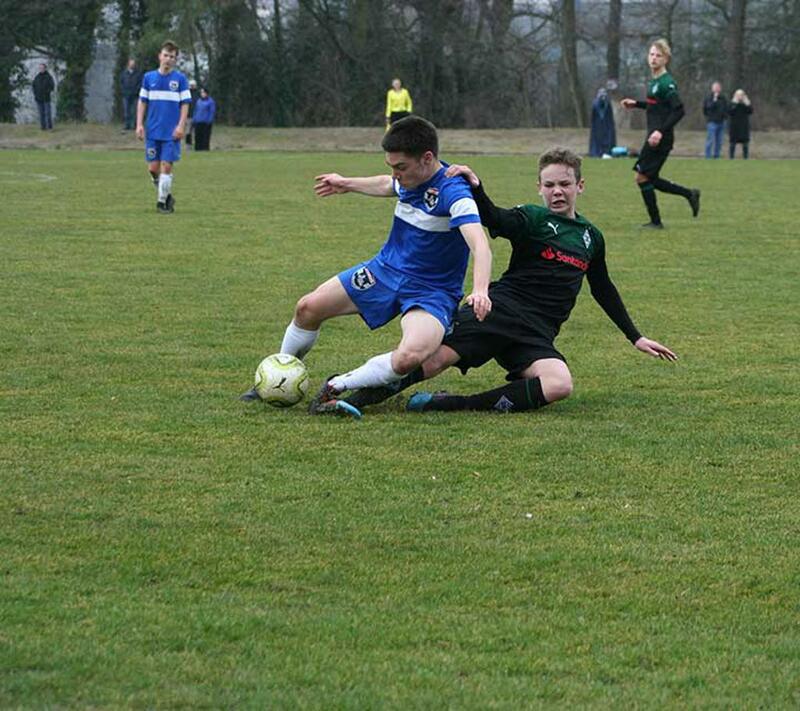 Playing against Monchengladbach provided our ’02 players with good competition. The opponent came out strong scoring three goals early in the first half. At halftime, our team made some offensive adjustments for a better performance in the second half. 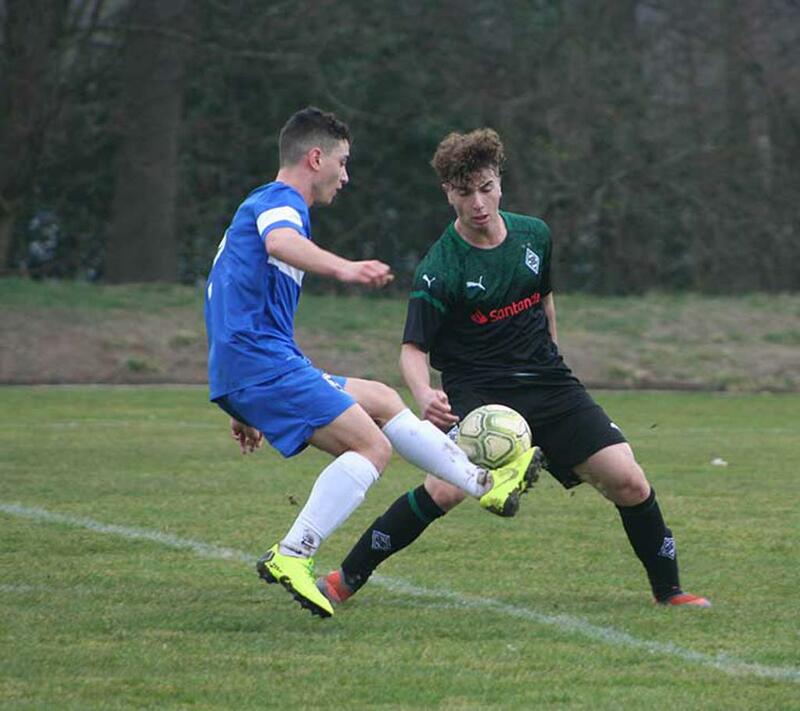 Not only were our boys able to hold Monchengladbach to their score, but the ‘02’s created several chances for themselves on the counter. After the game, both teams demonstrated excellent sportsmanship with spontaneous conversations and handshakes immediately following the final whistle. 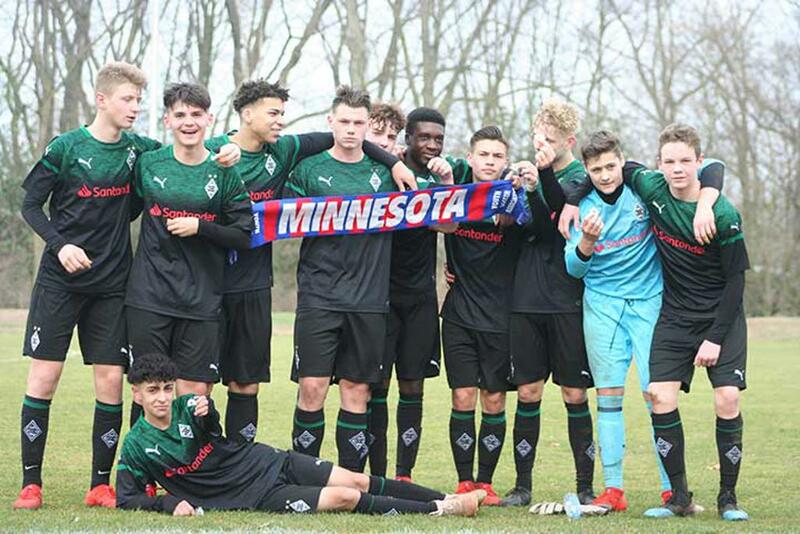 Our players invited Monchengladbach over to our bench to present each player with an official MYSA pin as a token of appreciation and good will. Our players then selected the MVP on the opposing team and presented him with a MYSA scarf. Our opponents seemed impressed by the gestures and we left feeling good about the exchange. We refueled with a hearty lunch of gnocchi, bolognese sauce, meatballs, gravy, green beans and potatoes as well as the standard salad bar, soup and cold cuts. 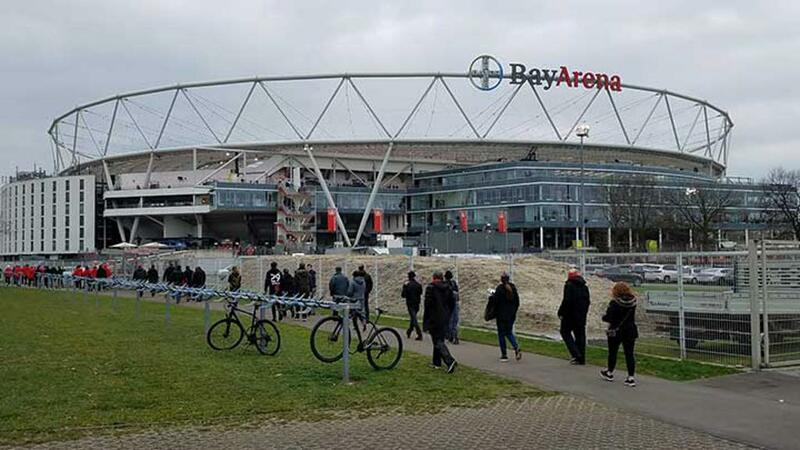 After lunch, our teams prepared to board our private busses to the small city of Leverkusen to watch Bayer 04 Leverkusen take on SC Freiburg. The area around the stadium was filled with fans chanting, singing songs and many wearing costumes. We learned that the week leading up to Ash Wednesday is heavily celebrated in this region with parties and festivals in honor of Rosenmontag or Rose Monday. Costumes are one of the traditions marking the Rosenmontag celebrations and were fun to see. Bay Arena was impressive. It had a spectacularly lush, natural grass field under an enormous steel cable oculus supporting a perimeter weather shield. The stadium holds 30K fans, offering a premium views from any seat. 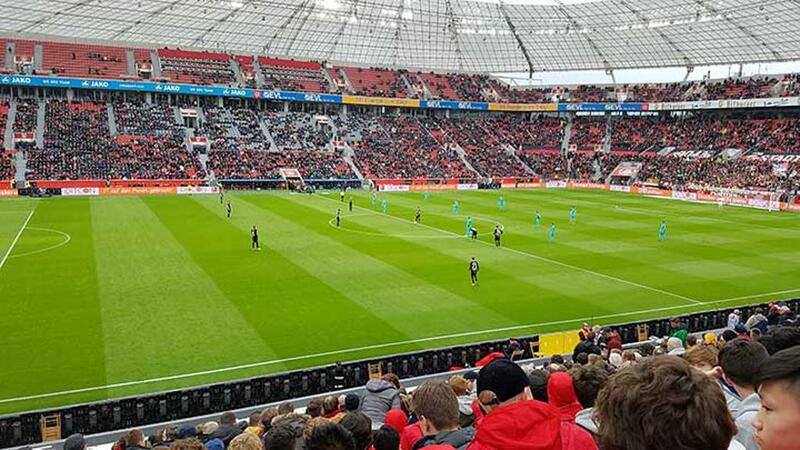 Our experience was complete with Leverkusen’s win 3–0 over SC Freiburg and the singing of Leverkusen’s anthem. It was fun to see many of our boys wearing Leverkusen scarves and joining in on the stadium’s unified chorus. By the time we boarded our buses, it was dusk and many of our boys tired from a busy day fell asleep on the ride back to Wedau Complex. Our bus driver, Augustus, was happy that we saw Leverkusen win and wished us much success during our week in Duisburg. We arrived back at Wedau ahead of our scheduled dinnertime and the hotel was able to accommodate us with an earlier seating time. Everyone was in good spirits and adjusting to the time difference. After dinner, our players had a few hours of free time to hang out and relax before lights out at 10:00 p.m. We are all looking forward to another exciting day tomorrow.